MY HEARTFELT THANKS. After I have taken over the world and repopulated most of it with my robotic creations, I will have your name written down somewhere. RADIOACTIVE COOKIES! I will bake them, test them on several lab rats for suitable potency, and then ship at least a dozen right to your door. NOTE: To save on costs, they will be shipped as media mail and may take some time to reach you. BECOME A ROBOT FOR A DAY! I will use the funds from this project to find a way to upload human intelligences. You can spend your last happy day on Earth inside the robot of your choice before I return you to your inferior body and what remains of your miserable life. PERMANENT NEURAL UPLOAD. The future looks grim for humanity’s survivors! Even if enough people are willing to pledge $50 apiece that the species will survive, it will be a hard life of gardening, fending off wild animals, robot attacks, and terrible hygiene. With this reward, you will thrive in a new body. For an additional $5,000 pledge, I will even allow you to choose your design. CO-CONSPIRATOR! Together we will rule the world with iron fists, at least until I tire of you, at which point I suppose we’ll end up as arch enemies and do battle across the scarred surface of the planet. It should be fun while it lasts. In order to make our harmonious co-habitation more feasible, I have built bunk beds. AN 8X10 GLOSSY PHOTOGRAPH OF THE ROBOT OF YOUR CHOICE CRUSHING THE SKULL OF YOUR WORST ENEMY. UNLESS your enemy has already pledged $50, in which case you have the option of choosing your second worst enemy. 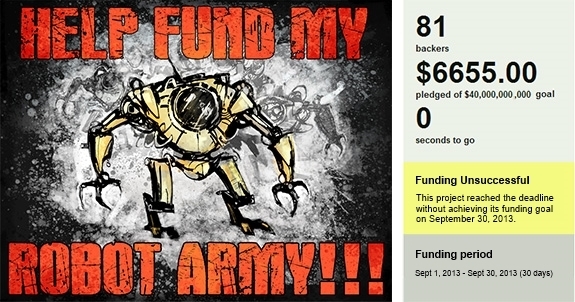 NOTE: If you have not also pledged $50 to be spared, I will instruct my Death Bots to allow at least 10 minutes for appreciation of your backer reward prior to your inevitable death. Please add $15 for international shipping. CHOOSE A LANDMARK TO BE DESTROYED. Is there a building or monument that you find to be in particularly bad taste? With this reward, you will be allowed to direct one demolition. Restrictions: None of my current or future holdings are included in the list of eligible landmarks, nor is the World’s Largest Rubber Stamp for reasons that should need no explanation. FIRST CHOICE OF NEW LIVING QUARTERS. While you can potentially survive the destruction of all you hold dear for far less money, mere survival is unlikely to be any fun! At this reward tier, you will be first in line for a choice of premium living cubes within my domed city. Make your friends jealous! BECOME A ROBOT TECHNICIAN. While the rest of your friends and family are sitting around unemployed and bemoaning their fates, you will have a full time job maintaining my robot army. Keffy R. M. Kehrli is a science fiction and fantasy writer currently living in Seattle. Although his degrees are in physics and linguistics, he spends most of his time in a basement performing molecular biology experiments for fun and profit. In 2008, he attended Clarion UCSD where he learned that, unfortunately, rattlesnakes don’t always rattle. His short fiction has appeared in publications such as Apex Magazine, Fantasy, and Escape Pod, among others. He is also an editor and slush reader for Shimmer magazine.